For the first time, researchers have been able to see a thought "swim" through the brain of a living fish. The new technology is a useful tool for studies of perception. It might even find use in psychiatric drug discovery, according to authors of the study, appearing online on Jan. 31 in Current Biology, a Cell Press publication. Credit: Current Biology, Muto et al. For the first time, researchers have been able to see a thought "swim" through the brain of a living fish. The new technology is a useful tool for studies of perception. It might even find use in psychiatric drug discovery, according to authors of the study, appearing online on January 31 in Current Biology. "Our work is the first to show brain activities in real time in an intact animal during that animal's natural behavior," said Koichi Kawakami of Japan's National Institute of Genetics. "We can make the invisible visible; that's what is most important." The technical breakthrough included the development of a very sensitive fluorescent probe to detect neuronal activity. Kawakami, along with Junichi Nakai of Saitama University and their colleagues, also devised a genetic method for inserting that probe right into the neurons of interest. The two-part approach allowed the researchers to detect neuronal activity at single-cell resolution in the zebrafish brain. 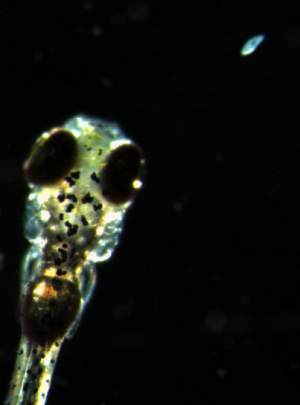 A double-transgenic larva was embedded in agarose, and a spot was presented on an LCD display placed on the right-eye side. Ca2+ signals were detected on the left tectum upon appearance (ON) and disappearance (OFF) of the spot. The spot was shown for the first 3 s in this 6 s movie. The video is shown at 3x real time. Credit: Current Biology, Muto et al. Akira Muto, the study's lead author from the Kawakami lab, used the new tool to map what happens when a zebrafish sees something good to eat, in this case a swimming paramecium. The researchers were also able to correlate brain activity with that prey's capture. The new tool now makes it possible to ask which brain circuits are involved in complex behaviors, from perception to movement to decision making, the researchers say, noting that the basic design and function of a zebrafish brain is very much like our own. Calcium signals are evoked by a swimming paramecium. Credit: Current Biology, Muto et al. "In the future, we can interpret an animal's behavior, including learning and memory, fear, joy, or anger, based on the activity of particular combinations of neurons," Kawakami said. 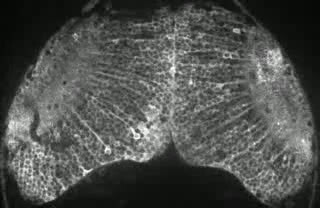 By monitoring neuronal activity in the zebrafish brain, Kawakami thinks that researchers may also be able to screen chemicals that affect neuronal activity in the brain. "This has the potential to shorten the long processes for the development of new psychiatric medications," he said. Is too much brain activity connected to Alzheimer's disease?